It is transfer season indeed. Every single day we read about riders changing team, staying with present team or just rumours, more or less accurate depending on the source. 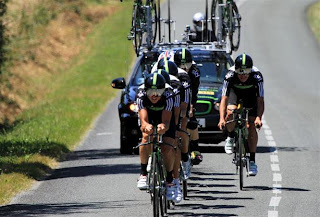 The newest “rumour” on the notebook is that of Tony Martin, going to Omega Pharma – Quickstep. Apparently, this is just a rumour, because others, like Daniel Benson of CN, say that Martin has yet to sign the contract. Confused yet? Not all riders are going to continue on the bike. Some will not seek the roads again, having studied while riding or due other reasons. Some continue behind the wheel of a team car, taking up on the important role as DS or rider developer. Why is this worth mentioning, I hear you ask. Well, firstly it is a topic many have neglected so far, which in itself makes it interesting. Secondly, a move like this is crucial for the future of the sport, something that should interest all of us. For the rider making that leap might find it difficult in the beginning. Some might find it hard not being in the spotlight themselves for a change, knowing that the world does not rotate around them anymore, some will experience a feeling of not knowing if he has what it takes. The team owner might fear the Peters Principle, since great palmares as a rider, not automatically guarantees any success as a DS. If we look at cycling the recent years it has evolved and it has done so in many ways. Like @sofaboy wrote in his post recently, “it’s time to start believing again”. We can all irritate our heart out on behalf of some decisions made by the UCI and we can debate this over and over again – so we should. But in addition to this perspective, culture can arguably being built from the bottom and up. This means that we should follow closely what happens inside teams, not only who the riders are, but also who is doing what, who’s coming from where stating what earlier. We should demand some answers from teams who hire people with dodgy backgrounds. Yes, as Brailsford said earlier: “it is difficult to find skilled people nowadays who hasn’t got a past”. Well, that may be true some years ago, but I don’t believe it is wise to hide behind that conclusion any longer. There are many talented people out there with a burning desire to help riders and teams develop further. I want those riders who continue as DS, or in other positions in teams, to be the best. They must have integrity, respect in the peloton, they must have something to contribute in order to make a difference. It could be that my expectations are high, perhaps too high, and it may be that I will be disappointed. Still, this is my view and hope. Luckily, I can think of many riders who can fill such positions when the time is right. Arvesen at Team Sky, Pinotti at HTC to mention a few. So let’s not forget that transfer season brings hope to the evolvement of cycling from inside teams’ staff too.